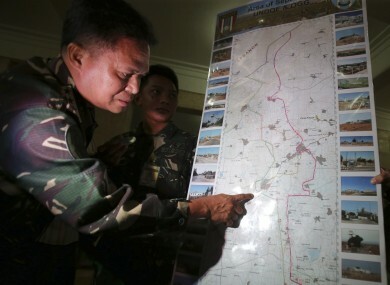 More than 70 Filipino peacekeepers have escaped from two areas that came under attack by Syrian rebels. Irish troops were involved in the first evacuation operation. Philippine military chief Gen. Gregorio Pio Catapang shows reporters where Filipino peacekeepers in Golan Heights have been repositioned. Catapang called it “the greatest escape” and praised the soldiers. “Although they were surrounded and outnumbered they held their ground,” he told reporters. “Everyone is in a safe position. We left our (old) position but we brought all our arms,” said Lieutenant Colonel Ramon Zagala. Philippine military chief Gen. Gregorio Pio Catapang answers questions from reporters. President Benigno Aquino’s spokesman Herminio Coloma issued a statement thanking the UN force as well as Syria, Israel, Qatar and the United States for their assistance in the crisis. “It is in our nation’s interest to give priority to (the soldiers’) safety but we will not turn our backs on our commitment to global security particularly in the Golan Heights and the Middle East,” Coloma said. He did not elaborate on the help provided by the other countries although the head of peacekeeping operations, Colonel Roberto Ancan said separately that the Syrians had provided “indirect fire support” that took the pressure off the besieged Filipinos. An initial group of 35 Filipino troops were picked up from their position by Irish UN soldiers in armoured vehicles early yesterday after Syrian rebels attacked their comrades positioned about four kilometres away. According to a Defence Forces spokesperson, Irish troops “deployed to the position, secured a withdrawal route, and escorted the troops to a reinforced UN position”. All Irish personnel were confirmed as “safe and accounted for” in the wake of the operation. The remaining 40 soldiers engaged in a “seven-hour firefight” with rebels who tried to ram the gates with pick-up trucks carrying anti-aircraft guns. A member of the 44th Infantry Group during a training exercise in the Glen of Imaal, Wicklow, ahead of deployment to Syria. In a statement, the UN said the 40 Filipino peacekeepers withdrew shortly after midnight “during a ceasefire agreed with the armed elements”. “There is no more standoff. All are safe,” Zagala told AFP. The rebels, including some linked to Al-Qaeda’s Syria affiliate, Al-Nusra Front, had earlier taken hostage 44 Fijian peacekeepers and even used an English-speaking Fijian hostage to relay their demand to the Filipino peacekeepers, the military earlier said. Asked what the Filipino peacekeepers would do now, Zagala said “we continue our mission. Our commitment is still there”. Israel seized 1,200 square kilometres of the Golan Heights during the 1967 Six-Day War, then annexed it in a move never recognised by the international community. - © AFP, 2014. Additional reporting by Daragh Brophy. Email “Philippine UN peacekeepers safe after Irish-aided 'great escape'”. Feedback on “Philippine UN peacekeepers safe after Irish-aided 'great escape'”.